Update: 13th November 2017 - We are delighted to announce that we reached our goal – we have raised €5.000! Thanks to your incredible support, animals like Galicia and Pablo are able to begin their new lives in safety at Wings of Heart Sanctuary. These babies, along with those animals whose stories we have shared over the last few weeks as part of the “Life Without Fear” campaign, live free at Wings of Heart thanks to the generosity of people like you. We are so grateful. Right now, we are preparing a very special final chapter to the campaign which we look forward to sharing with you very soon. In the meantime, the campaign remains open: there is still time to share or donate so please continue to spread the word. The money raised as part of the campaign will go to provide vital medication, food and care to all of the animals under our care. And animals who need our help keep on arriving on our doorstep. We need all the support we can get! Thank you so much for being part of our dream: that all animals deserve to live A Life Without Fear. On behalf of all the animals (and their carers) at Wings of Heart …. THANK YOU! The “Life Without Fear” series will introduce you to eight among the three hundred residents (and their closest friends) at Santuario Wings of Heart in Spain and share with you their stories. Over the course of two months, you will meet, among others: Agustin the pig, Parchis the goose and Evaristo the goat. Belonging to different species, with different personalities, likes and dislikes,what all of the individuals you will meet have in common is that they are “someone”. They are not, as they were considered by the people who brought them into the world with plans to raise them, kill them and make profit from their body parts, “something”.They are not commodities to be exploited but individuals with friends who they want to spend time with, love that they want to both give and receive and, above all, lives which they want to live for their own purposes. They are not ours to kill and consume. It is our privilege to be able to share our lives with them. We hope that, as you get to know our friends, you too will see them as we see them. Some of the animals you will meet have overcome horrific trauma – almost without exception they have experienced the heart-breaking loss of their mothers and friends, most have suffered physical abuse and injury and many have experienced emotional trauma – but each one of them is a fighter who refused to give up. From Trasgu, the blind lamb who was, literally, thrown to the wolves and yet survived to Evaristo, the little goat who was valued so little that he was put up as a “raffle prize” so that the lucky winner could “take their food home”, kill him and serve him up for dinner. We share their stories not just to invite you into their lives but also to ask for your help. When we take in any animal, we commit to providing a safe home for life to them.Most importantly, we make a promise to each and every one of them: that from the day that they set foot (or hoof, or paw) into the sanctuary, they will be guaranteedA Life Without Fear. For animals who have suffered so much, this is the very least that we can promise. But we cannot fulfil this promise alone, and this is where you come in. 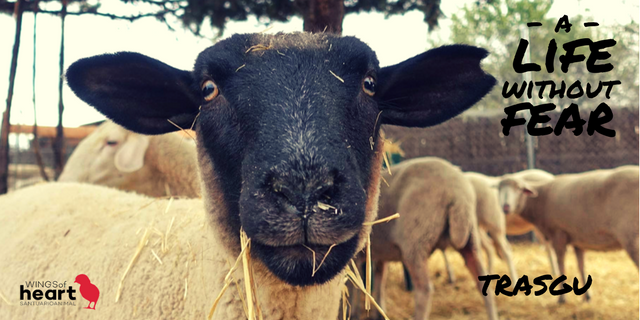 By making a small contribution today, you will be helping Pepa, the sheep who was left abandoned to starve to death in the middle of nowhere, in her ongoing recovery. She never lost hope that she was going to survive and we committed to ensuring that she did just that. In supporting our campaign, you will be helping those animals who we have not yet met, but who we know will need our help soon. Sadly, as the exploitation of animals continues at the highest level in our history, we know that the next animal who wants nothing more than to live a Life Without Fear will soon arrive on our doorstep. We cannot turn our back on them. Will you stand with us and help us to keep our promise? Will you give the gift of A Life Without Fear today? €5 euro will provide antibiotics for a baby animal. € 10 euro will allow us to carry out a vital health check on a new arrival. 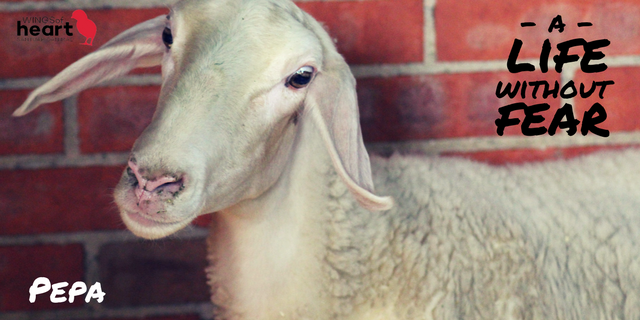 € 25 euro will provide colostrum for an orphaned lamb, like Paquita. € 50 euro will pay for emergency transportation to the vet for one animal. €100 euro will allow us to vaccinate one animal. € 500 euro will allow us to provide important, preventative, anti-parasite treatment for all of the animals at the sanctuary. € 1.000 euro will allow us to buy emergency first aid equipment (needles, gas, bandages and other equipment) to treat animals for three months. 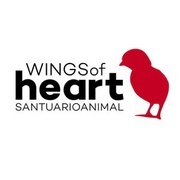 Founded in 2011, Wings of Heart Sanctuary, based just outside of Madrid, provides a safe home for over 300 animals who would have otherwise been sent to a painful, terrifying and premature deaths as part of the “livestock” industry. 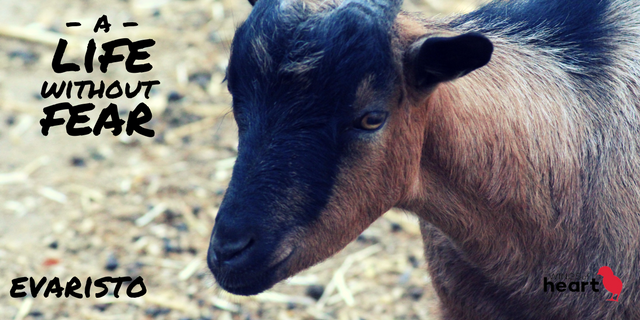 Caring for horses, donkeys, pigs, cows, bulls, geese, goats, ducks, chickens and other animals, our aim is simple – to save lives and to provide a home for life where animals can live without fear and surrounded by the love and respect that they deserve. Lifetime sponsorship of the animal of your choice.